I was wandering around Bedford Avenue with my dad after having brunch yesterday when I came across these two advertising takeovers. The first is an NPA City Outdoor location at north 6th which Maya Hayuk worked on for the NYSAT project. As many readers know, all NPA City Outdoor sites are illegal and should be painted over with impunity. The second takeover is on a more permanent Colossal Media painted advertisement for Virgin Atlantic. 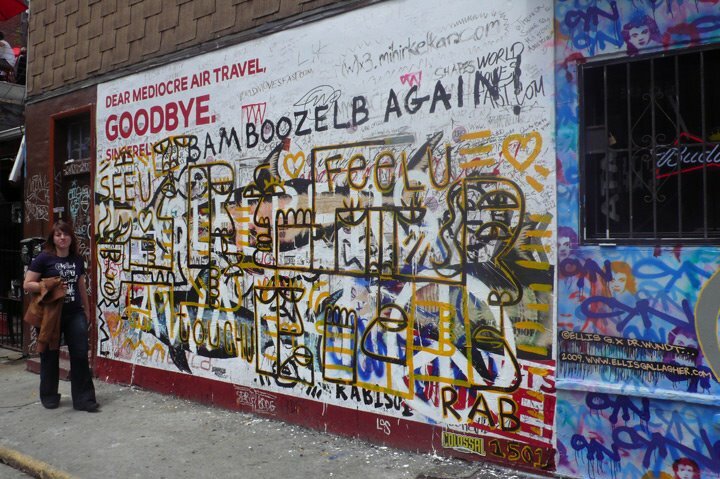 The "Flydealists Unite" campaign, still visible in the upper left and bottom right hand corners, was properly critiqued by Steve Lambert of the Anti Advertising Agency, and properly taken care of by street artists. 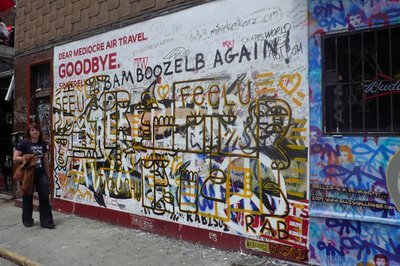 I'm assuming RAB is responsible for both of these pieces given the signature and style of both takeovers. If anyones knows him or her, please have them get in touch. I would love to ask them a few questions.